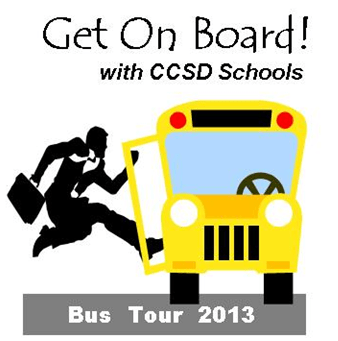 Cherokee County Schools – Get on Board! The Cherokee County School system partnered this week with GPEE, the Georgia Partnership for Excellence in Education as part of the Bus Trip across Georgia. This week makes the 21st Bus Trip for GPEE, with Cherokee County Elementary School, Clark Creek as the 1st stop for the event. Clark Creek Elementary school is located in Acworth off Hunt Rd and is 1 of only 4 Elementary STEM Schools in Cherokee County. After the initial stop, GPEE statewide tour, will visit Calhoun High School, Calhoun City Schools; and Murray County Pre-K, North Murray High School/Bagley Middle School, Murray County Schools. Those leaders also stopped in and visited the Community Partnership for Dalton City and Whitfield County Schools. This was the first year that GPEE came to Cherokee County so, the CCSD, Cherokee County School District, invited County business and community leaders to, “Get on Board! With Cherokee County School Bus tour on Oct. 29th to tour our Schools, so we could see what our own County is doing in regards to educating our children. I, as the current 2013 CAOR President and Linda Martin, the CAOR President Elect, were privileged to be invited to represent the Cherokee Association of REALTORS. There were about 40 in attendance from Cherokee County. Our day started around 8:30 am, and ended around 3:30pm. We started our portion of the tour in conjunction with GPEE and met at Clark Creek Elementary. The students lined the entrance and parking lot waving flags as the buses arrived. Etowah high school, which was our 2nd stop on the tour, had their marching band playing at Clark Creek to welcome the buses as well. When all had arrived, we met in the media center and all the participants stood up to introduce themselves. There consisted of educators, college students, Loundes High Schools students, and Business leaders from across the State of Georgia. The College and High Schools students were chosen because they are planning on becoming teachers when they finish their education. The first stop on the tour was our own Clark Creek Elementary school. WOW, is what I can say about this school! STEM stands for, Science, Technology, Engineering and Mathematics. This school was a technological wonder! It is set up as one of the forerunners in Technology for K through 5th grades with 950 students per day in attendance. A few of the classes we viewed, were a 2nd grade class which was an Inclusion class with a lab, there was a 5th grade Lab class that was problem solving task engineering. A 3rd grade math interactive group working on a Promethean ActivBoard and a class with a live feed from NASA in Houston Texas at the Johnson Space Center. The students were able to interact live with a scientist at NASA, and could ask questions. After our tour we were then transported in a yellow Cherokee County School bus to Etowah High School and then to the newly opened ET Booth Middle School. Etowah HS has the largest physical campus of all schools in Cherokee County and is one of the largest in the State. Etowah has had the highest SAT Scores, four years in a row. Etowah offers 4 different foreign languages to its 2370 students. ET Middle School just opened up its new building in August this year and has 1643 students. See attached info and articles on this event. I wanted to share what I learned about our schools and hopefully, you as REALTORS will find it valuable information.